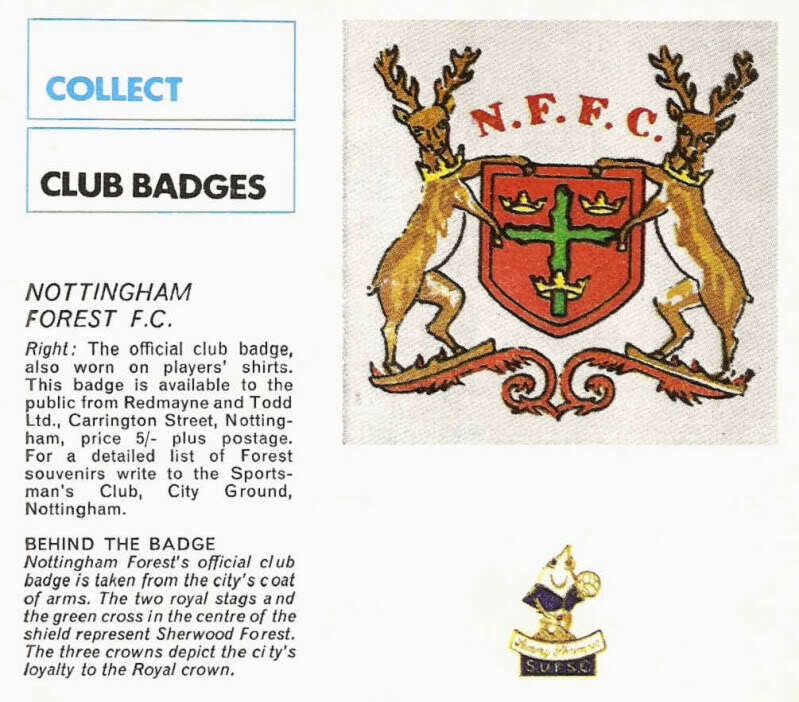 Nottingham Forest seem to have only had two football badges since they were formed in 1865 and there seems to be no history of a club badge before the 1940s. The first record of a badge for the football club seems to be from just after the Second World War when the club adopted the city’s coat of arms as an emblem. The Coat of Arms itself was officially recognised in 1614 and its centrepiece is a rough green wooden cross in the middle of a shield. The shield contains 3 golden crowns with one of them wrapped around the lower part of the cross. 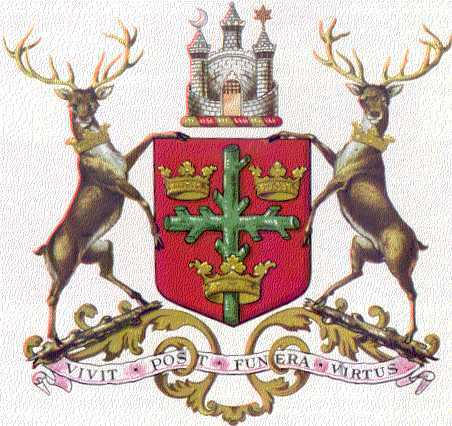 These crowns are there to signify the towns loyalty to the Royal Crown while it is thought the wooden cross is alluding to Sherwood Forest as are the Royal Stags supporting the shield. These Stags also wear a crown around their neck. Apparently the club used the Coat of Arms in this form but I cant find any confirmation of this or pictures. 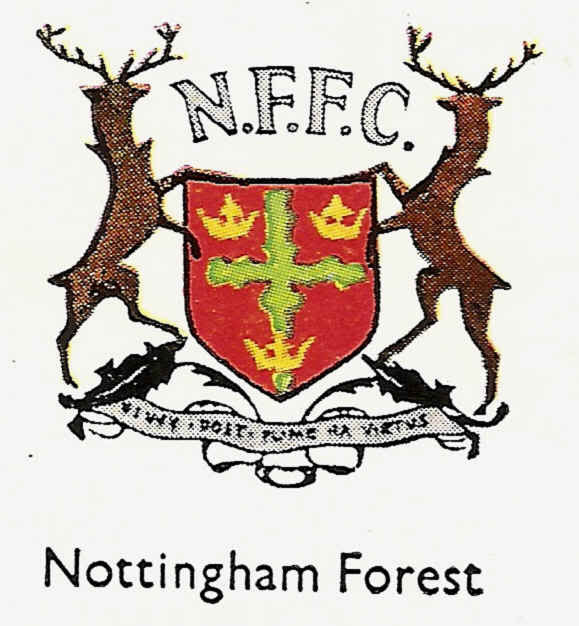 The football club did however at some point drop the castle that is above the shield in the original and replaced it with the teams initials NFFC as you can see in the picture below which was taken from the 1959 Encyclopaedia of Sport. Finally the motto reads “VIVIT POST FUNERA VIRTUS” which translates to “Virtue Outlives Death”. Another example is shown below from the Football Review “Collect Club Badges” series from the early 1970s. 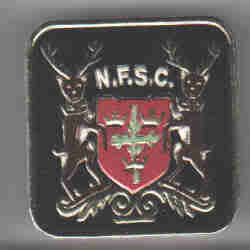 A slightly different badge is shown below, this was taken from the Esso Football badge collection issued in the 1970s and the badge has the initials NFSC instead of NFFC. 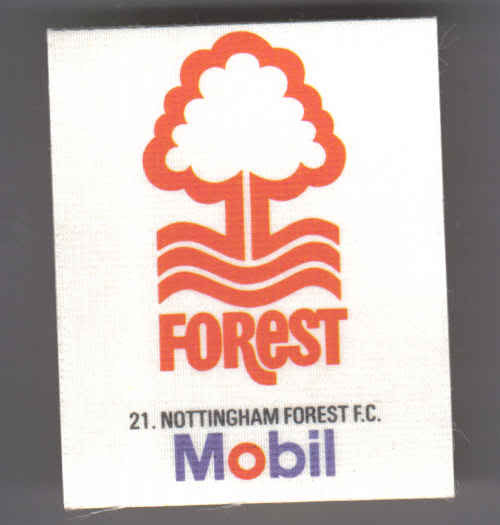 This may signify Nottingham Forest Supporters Club or maybe just be a mistake by the Esso designer !! Of course along with most other clubs commercialism overtook tradition and in order to copyright the football clubs badge (you cant copyright a Coat of Arms) it was decided to redesign the badge and a competition was held by the Nottingham Evening Post. The winner was a Mr David Lewis, a local college lecturer and his fairly basic design featured a tree to represent Sherwood Forest and what looks like waves underneath to represent the River Trent. The team name at the bottom finishes off the design. A nice example of the badge can be seen below, this was part of an Esso collection of football badges from the early 1980s. We do have these badges for sale on this site.. So there we are, not the most complicated of badge reviews but hopefully it has been of interest. Of course if I have got anything wrong or you would like to add to it please get in touch.